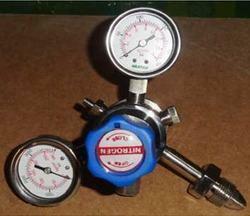 Pioneers in the industry, we offer gas regulators from India. We are assisted by our truly skilled and seasoned professionals in manufacturing and supplying a precision-engineered range of Gas Regulators that are used to reduce gas pressure. Our offered regulators are manufactured using quality approved raw material and progressive technology in adherence with industry norms. The provided regulators are examined by our experts on different parameters so as to ensure their quality.